We are excited to announce our new v12.4 release. 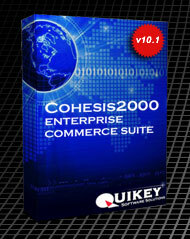 This latest version of the CohesIS2000 Enterprise Commerce Suite includes a multitude of new features and improved functionality. ECP.CSS is now broken out of EDGE_WEB and part of the STL. Can be overridden like any other page with removal of the PUBLISHER-GENERATED-TEMPLATE tag. Internal test suite has been expanded to nearly 400 self-diag tests. New SmarTag FFFFF1 permits the programmatic auto-generation of blended colors. Useful when mixing ECP colors with others…such as darkening or lightening a header color for example. The Force_800x600 mode in the ECP has been deprecated. Height/Width can be controlled via CSS in ECP.CSS on the Div.PgFrame selector. There is a mode to trap/log ASP errors encountered by users at the sites. Implementation requires a manual setting of the “Custom Errors” page for Error 500.100 in IIS. In addition to providing insight into user errors, this is also helpful for debugging. Support for SSO via SAML & encrypted SAML…both v1.1 and v2.0 are now built-into EDGE_WEB. All requisite cryptography tools are fully-integrated and seamless. The only required step to implement is to receive a public Key from your client in an X509 cert, and place it in the proper location. IF you have application for a SAML SSO, let me know and I’ll give you a quick overview. Support for Ariba/cXML Payment remittance advice document is built-in. At present, it simply emails the Cat admin with the Payer’s name & address, the name of the originating bank, the transaction Id, and a list of Invoice #’s and amounts being paid. In the future, this info will be mapped directly onto the Invoice Notepads of each of the invoices being paid. Color x Size grids now correctly support CPC qty/price breaks & Min purchase qtys. PGP cryptography support is now built-into the system (along with X509 certs) for custom integrations which require it. Data may be either transmitted or received using PGP or derivatives such as GPG. Online credit card processing is included. The tool supports over 80 online gateways, and we are in the process of certification with AUTHORIZE.NET. A variety of Event notification emails to the Prog Admin have been added, providing advance notification on Blacklisting, setup problems, etc. File upload functionality has been re-implemented using a more efficient framework. The performance improvement is most noticeable on larger files. All existing ftp-related tools have been converted to support both ftps and sftp as well as ftp. The secure tools require a public key from your client. All integration tools are bi-directional, supporting download & upload of data. Support added for UNICODE files as well as ANSI. Monitoring of inbound email boxes has been enhanced to support multiple POP3 mailboxes. Mailboxes are checked at 15-minute intervals. Bounce analysis for rejected email has been added, and updates the database seamlessly. To read more about the v12.4 release, visit our Online Manual.